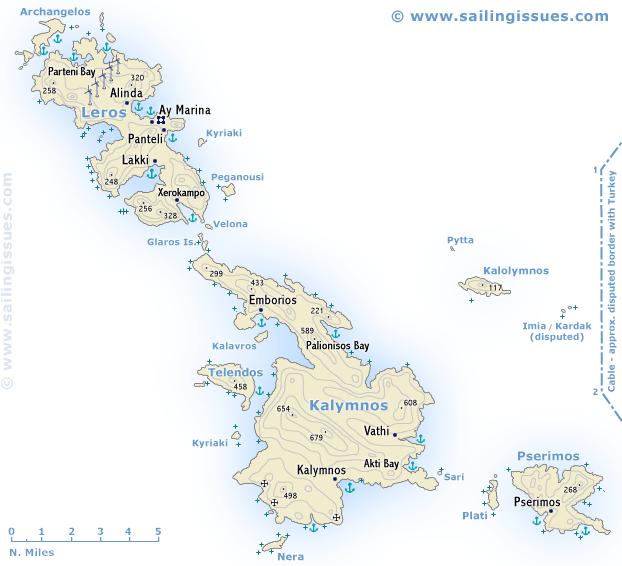 Kalymnos - Κάλυμνος is a bare limestone island, separated from Leros, by the narrow channel of Stenon Lerou. The coasts are mostly steep and rocky, with numerous coves and inlets ideal for a sailing holiday. The inhabitants live partly by farming in the few fertile valleys, but mainly by fishing for sponges in the south-eastern Med and processing them for export to the USA. The departure (April-May) and return (Sept-Oct) of the sponge-fishing fleet are celebrated with lively festivities. 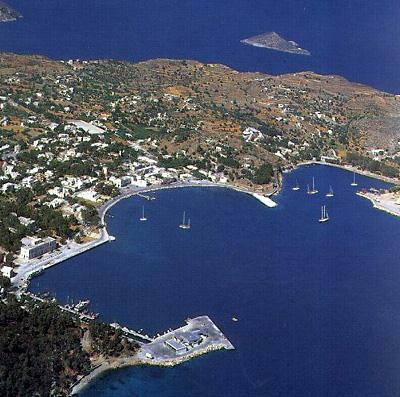 The island of Leros - Λέρος is hilly and fertile with an abundance of water and a much-indented coast. The inhabitants live by farming and fishing. Pserimos has a magnificent sandy beach to drop anchor at (just wait for the tripper boats to return to Kos). Finds in various caves round the coasts, particularly near Vathy port, show that Kalymnos has been continuously inhabited since the Neolithic period. The island never played a prominent role in history. Leros was in ancient times dependant on Miletus. Although continuously inhabited since then, it has never played a part of any importance in history either. In the 4th c. the Knights of St John established themselves on the island and held it against the Turks until the 16th c. During the Second World War it was a German naval base and subject to heavy attack. In the north Parthnion is still a closed military area. The island is highly renowned for its rock climbing culture with many interesting routes, see Climbing Kalymnos and other climbing routes. To combine this with a yacht charter holiday best to use Kos or Bodrum as starting base. 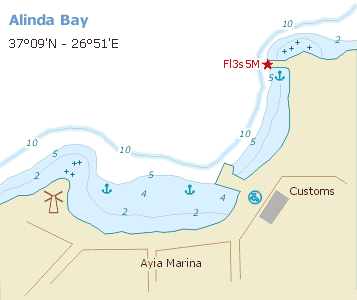 Alinda bay is located at the east side of Leros and is easily located by the Venetian castle higher up. During meltemi strong gusts in the harbour. 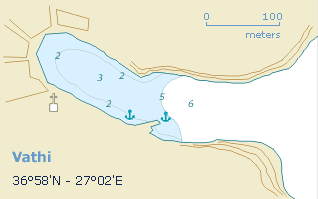 Seabed moderate/bad holding, so in strong winds move to the NW quay or sail to Pandali. The village of St Marina (Ayia Marina) is very pleasant; flowers, pittoresque houses and tranquil streets. The entrance of Ormos Lakki (Lakki bay) is only clearly visible looking NE. Once inside the bay Lakki town will be seen. 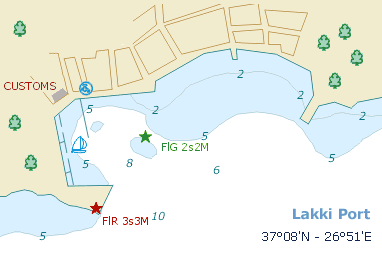 In Lakki Marina mooring lines are to be picked up at the quay (engine in neutral! ), but there are no actual mooring buoys floating. The harbour master will help you and subsequently lure you in to diner at his yachtclub. Say "Yes! ", because it is the best restaurant in town. The yachtclub also houses showers, laundrette and a lovely terras. The water is potable, though very brackish! 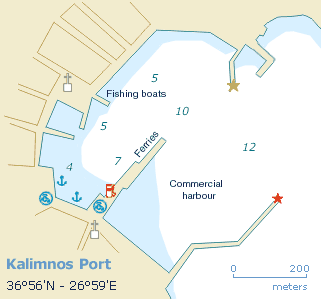 Lakki is the largest natural harbour in Greece, almost resembling a lake with its tiny opening of just 400m. The view of Lakki changed after the Italian rule in 1923 and as a result of that, new large buildings were built and wide and well paved roads were constructed. Near the waterfront there is a monument to those who perished in 1943 when a Greek ship, Queen Olga was attacked by German planes and sank in Lakki's harbour. 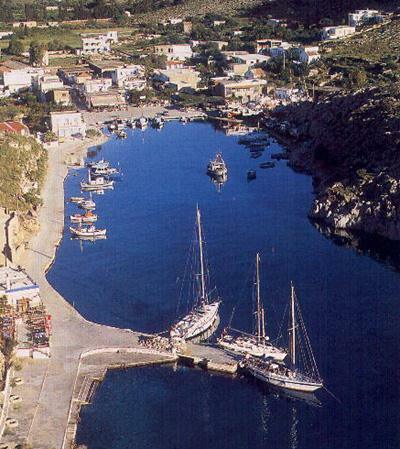 Lakki marina and port on Leros, looking ENE. In the distance: Piganousi island. 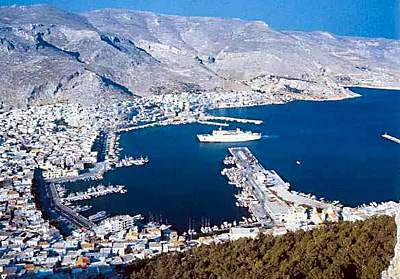 Limin Kalimnou, formerly called Pothia, is located in the south of Kalymnos island. From a distance Kalymnos town, the monastery on the hill and the shining cupola of the cathedral can be seen. The town, its handsome houses, in the neo-classical style popular in the islands in the 19th c., rises above the harbour on the gentle slopes fringing the bay. North-west of the town is the former capital of the island, Khorio (17th c.), with a byzantine castle. Halfway between these towns stands the Frankish stronghold of Pera Kastro. Sponge fishing means a yearly excursion and ev­ery spring the sponge-fishers of Kalymnos cast off for the seas off the North African coast. Their departure is a moving and important event, which is therefore accompanied by fancy religious cere­monies. After approx­imat­ely five months of hard work the sponge-fishers return to the island. The deep (blue) inlet of Vathi ends at the charming citrus-fringed village of Rina. Go bow-to the pier. Bottom is sand and weed with good holding. On the shore are few provisions, water and a 'yacht club'. Vathi has a narrow fjord-like entrance, opening up into a tiny fishing village at the head of the bay. It boasts one main street and a collection of houses scattered into the valley; an unexpected patch of lush vegetation on an otherwise very dry and arid-looking island. Vathi is the only place on the entire island that is lucky enough to have it's own spring water supply, and they use it carefully to cultivate citrus fruits, figs, grapes and anything else that can be persuaded to grow!